We are feline-friendly veterinarian exclusively for cats. Call now. Our love for cats shines through in everything we do! 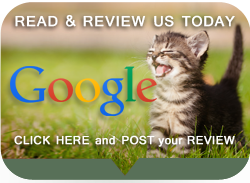 All About Cats Veterinary Hospital offers our patient form(s) online so they can be completed in the convenience of your own home or office. 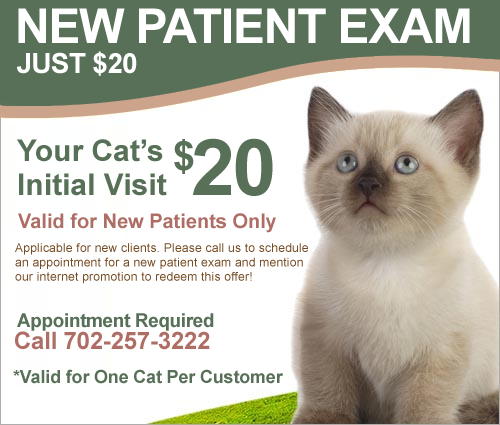 Welcome to All About Cats Veterinary Hospital in Las Vegas, Nevada, a feline-friendly environment that provides veterinary care exclusively for cats. Our name says it all: we're All About Cats! 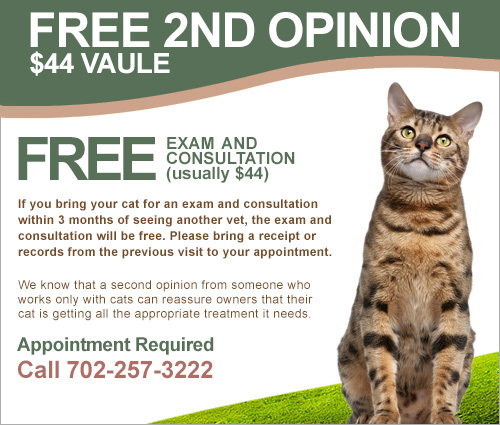 Our Las Vegas veterinarians and staff of “cat people” are dedicated to providing excellent care to cats and the people who love them. Our compassionate, talented veterinary care team brings a wealth of knowledge and experience to cater to our feline patients’ specific needs and health concerns. We strive to make every visit as calm and comfortable as possible for cats. Our cat wellness care servicesare dedicated to supporting cats through all six stages of the feline life cycle: kitten, junior, prime, mature, senior and geriatric. Our veterinarians are committed to helping all cats live long, healthy and active lives with specialized care for each phase of the life cycle. We also offer behavioral advice for common problems including destructive scratching, inappropriate elimination, feline aggression and environmental enrichment. 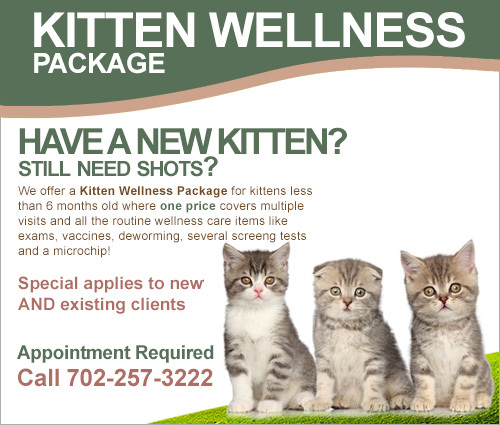 Our Las Vegas cat veterinarians specialize in feline surgical care and offer experienced medical treatment for feline diseases, including feline asthma, feline diabetes, gastrointestinal disease, urinary tract disorders, and dental disease. 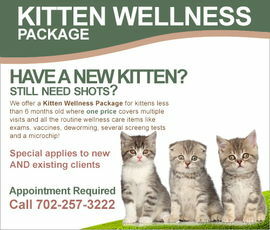 In addition to these services, our cat hospital includes an on-site pharmacy to quickly fill any prescription needs. Cat food for specialty diets is available for purchase at our Las Vegas veterinary hospital. Why Visit a Cats Only Hospital? Our veterinary team understands that a trip to the vet can be stressful for cats and their owners, so we created a cats-only environment. At our cat clinic, we know that the sounds and smells of other animals, including dogs, can be very frightening and upsetting to cats. That’s why our clinic does not allow dogs or other animals. This creates a calm, stress-free environment. We invite you to take a virtual tour of our cat hospital or schedule an in-person visit to learn more about the difference that our cats-only care approach can make for you and the special cats in your life. 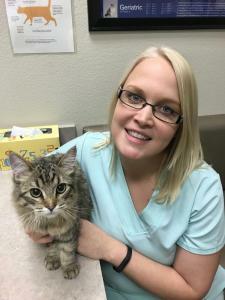 Dr. Terri Koppe founded all About Cats Veterinary Hospital in October of 2001 after recognizing the need for a cat-exclusive Las Vegas veterinary hospital. 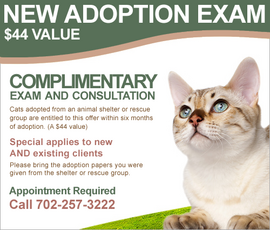 Dr. Koppe is joined by Las Vegas cat veterinarians Dr. Laura Klaassen, Dr. Alissa Lansing and Dr. Ashley Love. 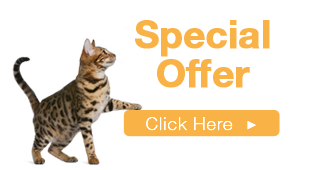 All our veterinarians specialize in feline medical, dental, and surgical veterinary care and are passionate about helping cats live healthy and happy lives. 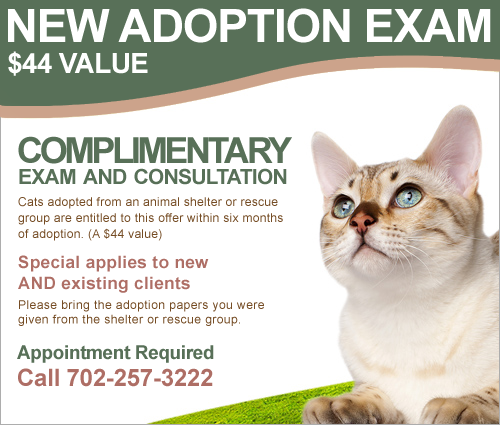 Our mission is simple: provide experienced, loving care just for cats at our Las Vegas veterinary hospital. Our love for cats shines through in everything we do! As evidenced by our cat-only environment and feline-friendly boarding area, our animal hospital is committed to providing the best in veterinary care for cats. Please call us at (702) 257-3222 for an appointment. "Very nice staff and a great Doctor. they took great care of my kitty"
"Cat's and humans alike are treated with dignity, kindness and professionalism." "Clean and friendly place and know what their doing , we feel good about the place and if we ever go on vacation they have a clean and tv and toys for their borders.."
I grew up in Las Vegas, and my earliest memory of wanting to be a vet is from 6th grade career day. We were asked to choose two classes to attend that matched our career interests. I was so sure I was going to become a vet that I chose the 'Becoming a Veterinarian' class, and just to have fun for the second class, I chose the 'Cartoon Making' class. Good thing the veterinary thing worked out! I grew up in the Midwest and attended veterinary school at Michigan State University, graduating in 2004. I then practiced small animal medicine which included dogs, cats and exotics for three years in North Carolina. During those years I developed a preference for cats and an interest in specializing in feline medicine and surgery. I joined 'All About Cats Veterinary Hospital' in 2007 to pursue that interest. My passion for working with animals started at an early age being raised in a house with never less than 4 pets at any one time. I was born and raised here in the Las Vegas valley, but when it came time to attend college, I decided to venture off to Oregon State. I received my Bachelor’s degree in Zoology from OSU while enjoying the outdoors and everything the state of Oregon had to offer. After taking a year off, I moved on to veterinary school at Colorado State, dragging my elderly cat, Patches, all across the country with me. I grew up in Philadelphia, Pennsylvania. I first moved out of Philadelphia to attend Delaware Valley University for my undergraduate courses. During those years I developed a love for traveling, very much enjoying the experience that visiting new places and learning new cultures brings. This turned in to a passion that lead me to move to Glasgow, Scotland to attend the University of Glasgow to obtain my veterinary degree.